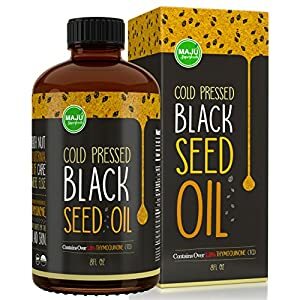 ✅ SUPERFOOD FOR JOINTS, SKIN, & HAIR: Blackseed oil (aka Kalonji Oil, or nigella sativa oil) is packed with powerful nutrients that can help unleash a youthful appearance and vibrance that you will notice. It contains a large dose of omegas, amino acids, and antioxidants. We consider it an extremely important source of fatty oils for your everyday life just as the ancient Egyptians and Ottomans did. People love taking it for hair growth. ✅ HEARTH HEALTHY & DIGESTION SUPPORTING OILS: Maju’s oil has a more powerful array of omega 3, 6, & 9. It will help support your body’s cardiovascular health. It is also known to support the regulation of the metabolism and to soothe digestive processes. ✅ MAJU’S 30-DAY PROMISE: Try us out for 30 days. Don’t like it? No questions asked, you’ll get a refund. We’re in this with you for the long haul. No hit n’ run superfoods here.